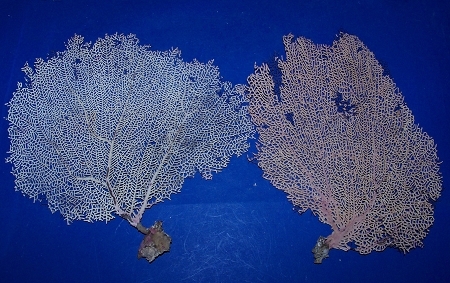 Dried Natural Sea fan, Sea Nature Coral. We offer them between the sizes Listed or around 7" to 11" and around 11" to 15"+ in size. Some may be slightly smaller or larger generally 1/2" or less. They are measured by length and or width and are pretty much thin like a chip. Each one has unique markings and colors from a red to pinkish tan color based on stock and will show signs of defects and wear and tear from being real and not man-made. No two are exactly the same. Please be aware We do Not advise the use of these fans in Fish Tanks. Some parts may fall off during shipping due to the fragile nature of the item. These are a beautiful species to add to any collection or use in a craft for display at sea life weddings, Great for display in a shadow box and more. This fan can also be painted to any shade. each one is unique. Wonderful seller! Top notch quality sea fans. Best Quality we have ever offered in our store to our customers. We will be back for more. What beautiful Specimens. By far the best I have ever seen.